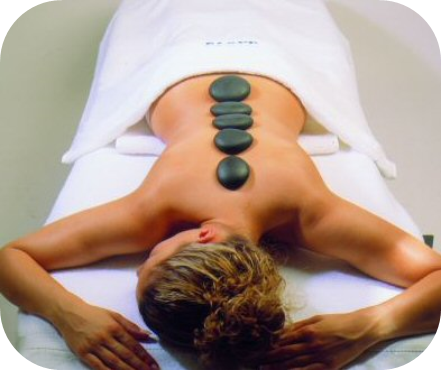 The specificity of this massage is the use of black basalt volcanic stones which are placed at tension spots along the body’s meridians. They also serve as massage tools: the practitioner uses them to rub and smooth the areas to be treated in cases of cellulite or water retention. The hot stones, aligned along the body, are able to restore balance in the body’s energy flux and to target certain points of tension in the body, in order to relieve them. The stones are kept at a constant temperature in a hot water bath. Of American Indian origin, the “hot stone massage” uses basalt stones of volcanic origin for their properties and their capacity to retain heat. The touch of the “hot stone massage” is more than a skin, muscle or limb massage. Through the massage, one is offered a return to the original source. The fire energies of the basalt stones and the water energies of the sea stones or marble lead one’s cells into a whirlwind of unexpected sensations, making it impossible not to let go and relax.